More Space. Less Money. Makes Sense. Extra large New Westminster condos are coming soon the market at the Westbourne Residences featuring 1, 2 and 3 bedroom floor plans starting from just $199,900! Parking and storage are included too! Centrally located in the heart of New Westminster’s quiet Brow of the Hill community, Westbourne condo residences is steps from daily essentials and a short drive or transit ride from Metrotown, downtown and beyond. The homes at Westbourne New West are designed for comfortable living, with generous floor plans, parking and storage, and exclusive amenities both inside and out. The grand opening will be in April 2016 with two bedroom homes starting from just $349,900. At Westbourne Residences, residents are only four blocks to Burnaby, 7 minutes to Highway 1, five minutes to Highway 91, eight minutes to Alex Fraser Bridge and eight minutes to Metrotown. Get from here to anywhere in a flash! 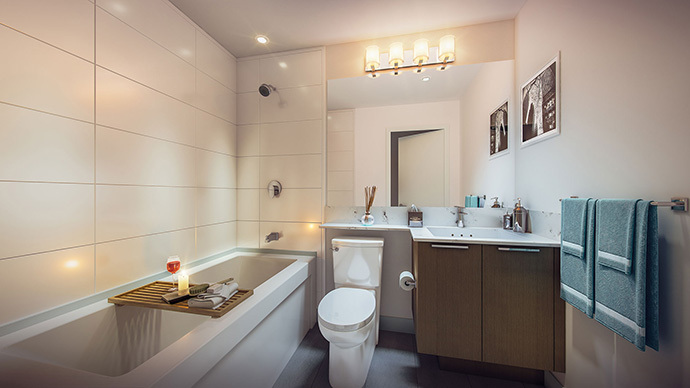 Living at Westbourne New West condos puts you in the heart of the Greater Vancouver area with quick and convenient routes to Vancouver, the Tri-Cities and beyond. Westbourne Residences will be located in New West’s historical West End neighbourhood which is affectionately called Brow of the Hill by locals. It’s re-emerging quickly and it’s also fast becoming one of the most sought after neighbourhoods in town. New homes are drawing great restaurants, boutique stores, services and a great blend of both historic and modern. There’s energy and optimism in the air – a sense that anything is possible. For more information about the Westbourne New West condos, please visit www.westbourneliving.com or simply register on this page for more details as they become available. The project is brought to you by Jago Development Inc. The architect is Ciccozzi Architecture. 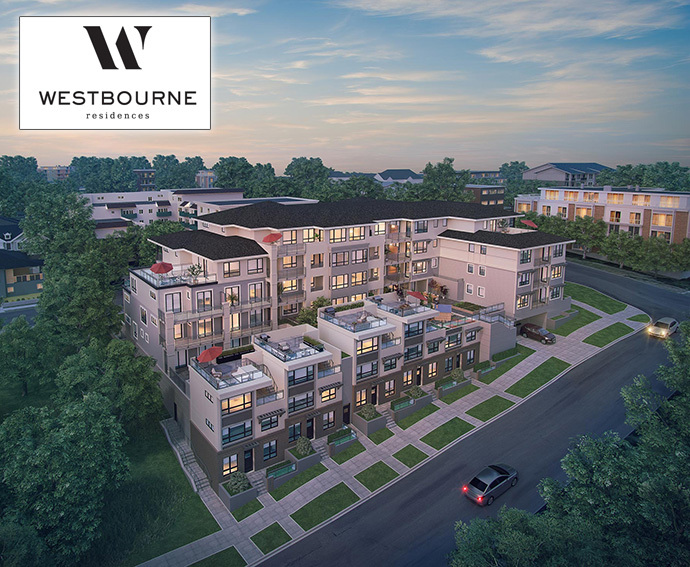 WESTBOURNE’S COLLECTION OF 55 THOUGHTFULLY DESIGNED HOMES WILL BRIDGE NEW WESTMINSTER’S PAST AND FUTURE, BLENDING CONTEMPORARY ARCHITECTURAL FEATURES WITH CLASSIC BRICK FINISHES. 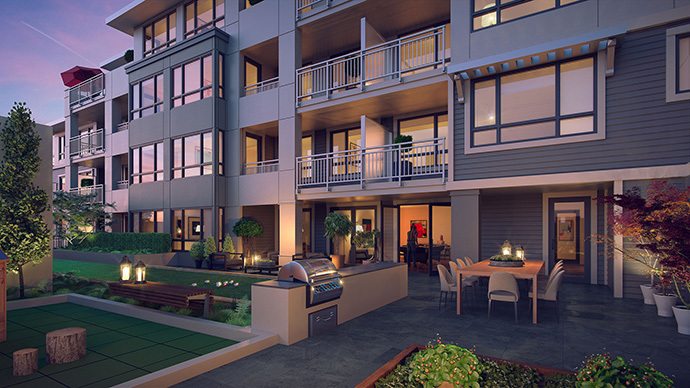 An exciting variety of floor plans are available in this boutique low-rise condominium building in the heart of New Westminster’s West End neighbourhood. There’s almost a different floor plan for each of the 55 Westbourne residences! 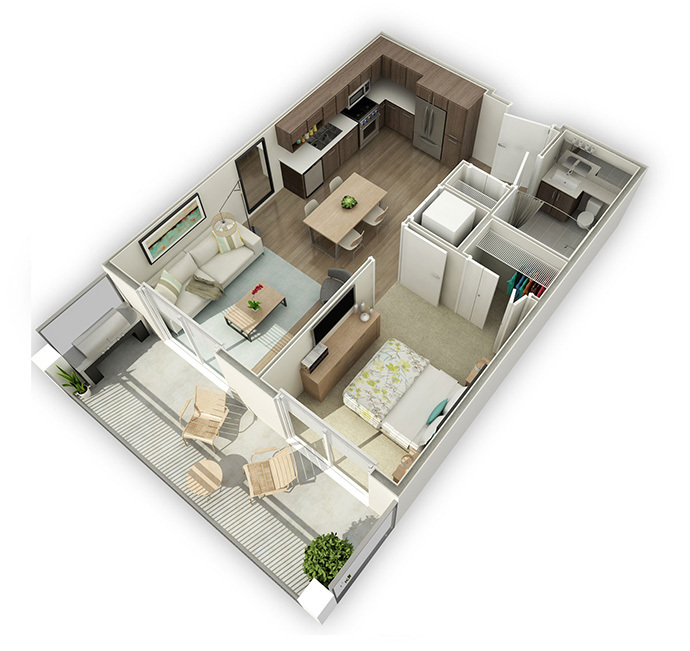 The 1 bedroom layouts range in size between 535 and 701 square feet. The most spectacular is the A1-R suite plan which has 526 square feet of interior living space in addition to a 485 square foot expansive roof deck! The two largest 1 bedroom floor plans (B and G-03) have a den as well. The spacious 2 bedroom Westbourne New West condo layouts range between 825 and 1,092 square feet. Again, the D plan is the most impressive with 903 sf of interior living plus a 345 sqft roof deck. Some of them also have a den in addition to the two spacious bedrooms. The E plan is a three bedroom/2 bath layout while E1 is 1,089sqft (both are one level condominiums). 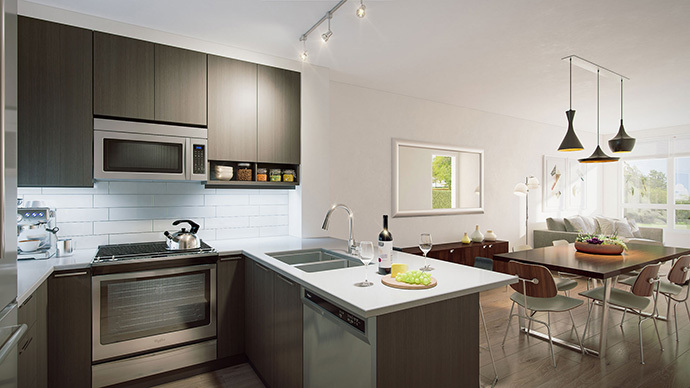 Spread over 3 levels of living space, the New Westminster Westbourne Townhomes are 3 bedroom and 2 bathroom layouts at 1,270 square feet PLUS a roof deck of 324 square feet. There are four such townhouses for sale. One-bedroom homes at Westbourne Residences will be priced from only $199,900. There will also be three-bedroom townhomes available from $399,900. Regardless of the floorplan, all residents will enjoy quartz countertops, sleek laminate cabinets with soft-close features, under cabinet lighting, full size stainless steel appliances with a gas cooktop, front loading washer and dryer, European-inspired wide plank laminate flooring, carpet in all bedrooms, and quartz vanity countertops and spa-inspired bathtubs in bathrooms. SPACIOUS AND STYLISH WITH ROOM TO RELAX. New Westminster Westbourne condo’s timeless design extends inside, with spacious, thoughtfully planned interiors and quality finishes creating homes of unmatched value. 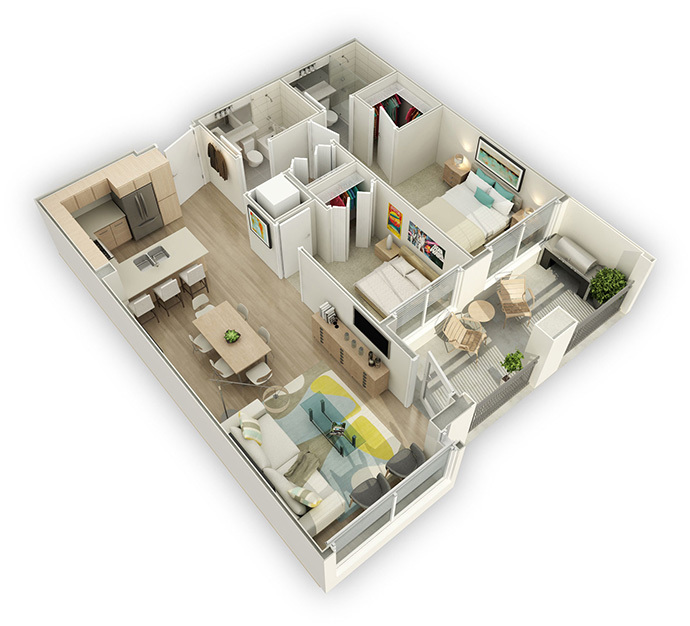 Flexible and smart floorplans offer a comfortable home crafted for exceptional everyday living. Two contemporary colour palettes offer the opportunity to express yourself. Some of the incredible features of the Westbourne Residences include 3 cm quartz counters with breakfast bars, sleek laminate soft close cabinetry with full height uppers, pantry storage in some floor plans, under cabinetry lighting and full size stainless steel appliances with gas cooktop in the kitchens. All homes will have a full size front loading washer and dryer. The main living areas will feature European inspired wide plank laminate floors and the bedrooms will come with 32oz carpet. The bathrooms will have 2 cm quartz vanity countertops, undermount rectangular porcelain basin, European spa inspired bathtub and ensuites with glass enclosed showers.